Starting 1 July 2017 bitcoin and other digital currencies will no longer be subject to the Goods and Services Tax (GST). The federal government made this announcement in the 2017-18 federal budget on Tuesday, 9 May 2017. The treatment of digital (or crypto) currency for GST purposes has been hugely challenging for the Government. Digital currency refers to things such as bitcoin, although there are apparently over 600 other currencies available. Tax Office rulings released in December 2014 (GSTR 2014/3; TD 2014/25; TD 2014/26; TD 2014/27 and TD 2014/28) set out the Tax Office view that bitcoin is neither money nor a foreign currency and the supply of bitcoin is not a financial supply for GST purposes. In its view, transacting with bitcoin is like a barter arrangement, with similar GST consequences. 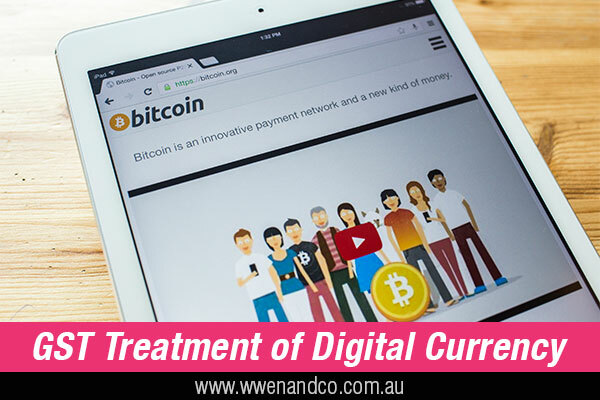 The result is that trading with bitcoin can give rise to a form of double taxation for GST purpose – once on the purchase of the digital currency and again on its use in exchange for other goods and services subject to GST. a Government discussion paper in May 2016. The proposed changes are a result of these developments. The changes will be designed to ensure that purchases of digital currency are not subject to GST. There is no specific detail as to how this will be achieved, ie the legislative changes that are necessary.